As of 2013, women in all five branches of the United States military will be allowed to officially serve in combat roles and be paid accordingly. Last year, several women's organizations filed lawsuits over Department of Defense policies that continued to forbid women from being considered combat troops. In total, approximately 237,000 combat based jobs that were not previously available to women have been opened up to them this February. The Department of Defense is planning to integrate these combat units using similar tactics to when the United States Navy began allowing women to serve on submarine missions. According to Defense officials, the department is engaged in a continuing process this year to stop gender discrimination and barriers to women serving in combat roles and other non-traditional gender roles. Proponents of these changes have pointed to the fact that while women were not previously allowed to be considered combat troops, thousands of female soldiers have already become casualties in the wars in Iraq and Afghanistan. In contemporary urban warfare, the lines between combat troops and auxiliary or support troops are very blurred. It was often impossible for women to avoid being in the line of fire, even if they were not considered to be combat troops, yet they did not receive the same pay or benefits as active combat troops. Because combat roles also tend to have a bigger effect on promotions, women in the military had complained that they felt they were being kept from advancing by the no-women policy for combat troops. This created something of a glass ceiling in military branches, where it became much easier for men to be promoted than women with similar skills and capabilities. With the new policy in place, women will be better able to pursue positions in the military that would help them to advance their career in the long term. The new policy raises a number of interesting legal questions. Perhaps the biggest is what will become of the Selective Service, or draft, system. Currently, only males are required to register for Selective Service. When this policy has been challenged by women's organizations, the Supreme Court has said that it was fair because only men could be combat troops. 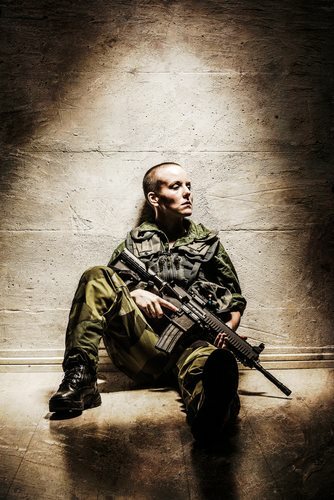 Now that women are allowed in combat, the biggest reason judges have cited for keeping women out of the draft is gone. No case has yet been filed regarding the Selective Service issue since the Defense decision.